What if you don't have the money to pay the tax? Remember that an estimated tax payment is also due. Remember the second California real estate tax payment is due April 11. Visit our new article: Psycho-Cybernetics Updated and Expanded. 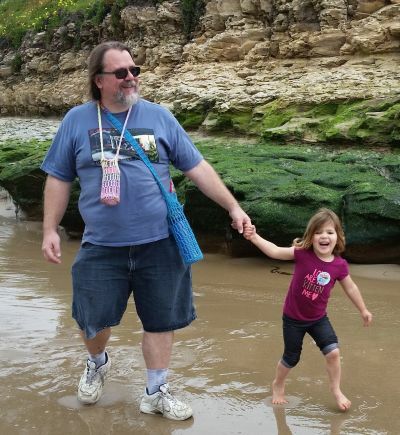 My granddaughter, Minnie Siemer with Daddy John Siemer near Natural Bridges Beach. Babe Ruth was one of the greatest baseball players of all time. April 27, 1947 was declared Babe Ruth day and celebrated at every ballpark in the United States and Japan. Babe's record for the most home runs in a season stood for many years, but was eclipsed, partially because baseball season is now longer. Babe's other record, not so well known, is for the most strikeouts. There is an important lesson in the combination. We remember you, Babe! If you want us to prepare your 2015 income tax returns and we haven't already received the information to do so, we will probably have to prepare extensions. Please call Dawn Siemer immediately on Mondays, Tuesdays or Thursdays at 408-918-3162 to make an appointment if a meeting is essential. April 18, 2016 is the due date for 2015 calendar year individual income tax returns, fiduciary income tax returns and partnership income tax returns. You can usually apply for extensions of time to file the tax returns and there can be advantages for doing it, such as extending the time for making a contribution to a qualified retirement plan. Remember, the time is not extended for paying the income tax. Even if you are applying for an extension, you still need to make a good estimate of the tax. If you don't pay at least 90% of the tax by April 18, there is a potential penalty for filing the tax return late. That's 5% per month to a maximum of 25%. There are even more serious penalties that can sometimes apply. If you don't have the money to pay the taxes, I recommend that you file as good of a tax return as you can by April 18 and "fine tune" it with an amended tax return later. This should help you avoid the penalty for filing a late income tax return. The first 2016 estimated tax payment for individuals and most other calendar year entities is also due on April 18, 2016. The penalties for late payment of estimated taxes are computed as simple interest, currently at low interest rates. There is a nasty penalty for paying real estate taxes late, and the date slips past us because we're thinking about April 15. Why not make this payment now, so you don't forget it? Financial Insider Weekly broadcast schedule for April and May. Financial Insider Weekly is broadcast in San Jose and Campbell on Fridays at 9:30 p.m., Pacific Time. You can watch it on Comcast channel 15 for San Jose and Campbell. The show is broadcast as streaming video at the same time at www.creatvsj.org. April 1 and 8, William J. Mitchell, CPA, "I'm being audited by the IRS! Now what?" April 15, William J. Mitchell, CPA, "Appealing your tax audit"
April 22 and 29, William J. Mitchell, "I owe the IRS! Now what?" May 6, Greg Carpenter, business broker, "Buying a business"
May 13, Greg Carpenter, business broker, "Selling a business"
May 20 and 27, Bettie Baker Marshall, Attorney at Law, "Legal concerns when caring for an incapacitated friend or relative"
Real estate investors, have you subscribed to Michael Gray, CPAâ€™s Real Estate Tax Letter at no charge or obligation? I have also started a blog at www.michaelgraycpa.com. Check it out!